2015 was filled with many great movies. We had some great blockbusters. We had a huge influx of spy movies this year. A lot of revivals of franchises of yesteryear. The Oscars were filled with many great movies with some even better performances. In this post I am going to be going through my picks for my top 10 movies of 2015. To decide this I will be using a combination of how good the movie was and also just how much I enjoyed it to come up with my list. The film must of been theatrically released in 2015 in the UK for it count so if a film came out before 2015 elsewhere in the world, it will be in due to it's UK release date. I also haven't seen every film this year so if there is a favourite of yours that isn't on this list, feel free to comment saying what should be there and why I should see it. So lets get started! Due to there being a lot of great movies this year there are of course some honourable mentions. Jurassic World was a fun and enjoyable movie despite many flaws. An entertaining film and nothing more really. Marvels Ant Man was a huge surprise too in which was another entertaining movie from the juggernaut studio. Jake Gyllenhall's performance in Southpaw was incredible in which was another great movie of 2015. It did follow the standard boxing movie routine but did feel pretty fresh as it narrowly missed out on the list. A shout out also to The Gift which I thought was very good and felt pretty unnerving. It also brought us Jason Bateman portraying one of the least likeable characters we seen this year. Many spy films were released his year with Mission Impossible: Rogue Nation, Spy and Kingsman missing out. John Wick was another of my favourites but also just missed the cut. Now that the honourable mentions have been credited, lets start with number 10! 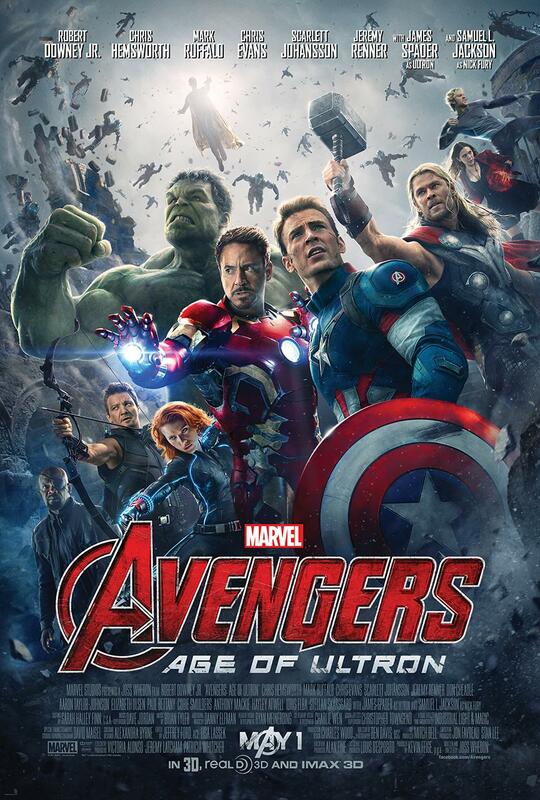 The list starts off with Marvels main blockbuster this year, Avengers: Age of Ultron. The sequel to Avengers brought in the big bucks as it grossed over a billion dollars worldwide. I had a great time with this and was overall satisfied with Age of Ultron. I do understand some of the criticism that does come in it's direction as it does look to set up other Marvel projects in which will be their phase 3. However as a fan of the Marvel Cinematic Universe I really enjoyed this film. Possibly due to the recent films building these characters and making me care for them helped do so. The introduction of the new characters such as Ultron, Quicksilver and Scarlet Witch were all welcome and good inclusions. The great characters as well as the phenomenal action makes for a great addition to the Marvel Cinematic Universe. I didn't have huge expectations for Steve Jobs. I thought it would be a solid film. However it was much better than that. With Michael Fassbender as Jobs, he gives an incredible performance which may very well gain him an Oscar nod. 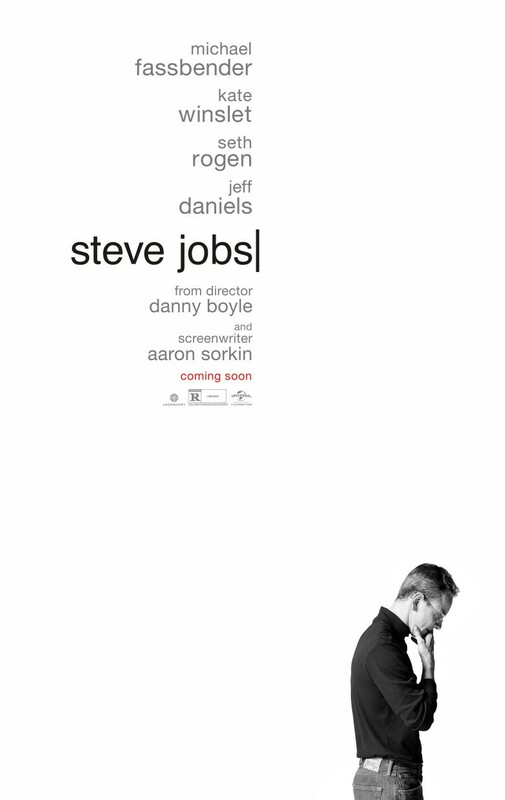 As someone who doesn't really know much about Steve Jobs, I found myself thoroughly invested in this movie and actually learned quite a lot. This really is solely a film with a lot of talking but the combination of Aaron Sorkin's writing being magnificent and the actors performances allowed this to be very interesting and kept my attention for the whole time. Other performances from Kate Winslet, Seth Rogen and Jeff Daniels were also great but Fassbender is the clear star. Right now I feel that Fassbender could be in nearly anything and I would be captivated by him. One of the best today and his performance makes this film incredible. Although not being a particular fan of the scary/horror genre, I found a great deal of enjoyment from It Follows. This film could of quite easily been very silly due to it's plot and what the story is based around. However It Follows is a very creepy film and makes you wonder how you would act if in this situation. We get to see our main character constantly breaking down and feeling the effects of paranoia due to what is constantly happening to her. The score from this film helps this mood be conveyed and it does an incredible job in doing so. I enjoyed this film a whole lot more than I expected to and would highly recommend It Follows. A very eery and unsettling movie that movie fans will enjoy from start to finish. Damn you Pixar you did it again. Once again the animation studio have done an incredible job of making a fun, entertaining family movie, Once again they also made a film with a much deeper meaning so that it can relate to adults as well. Another great from Pixar as they continue to show how animation should be done. Amy Poelher as Joy was a perfect casting for the voice as all of the different emotions were great. The story for this was great and both kids and adults will get huge enjoyment from this film. It's incredible how Pixar can make you laugh so much and then in one second hit you with something hard so you get the emotional side as well. 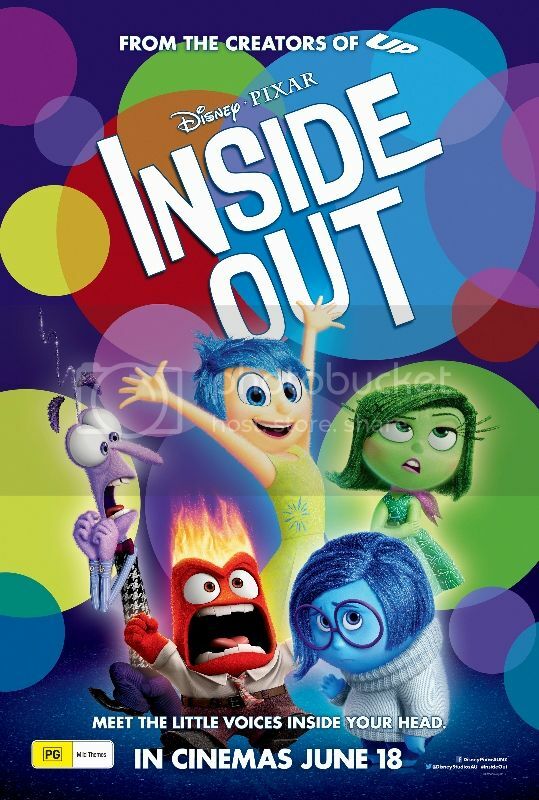 A great movie to add to the long list of incredible movies from Pixar. Even though it ripped off The Numskulls comic from the Beano. Steven Spielberg and Tom Hanks are back in work together for the fourth time. Whenever one of the greatest directors and greatest actors team up it cannot be missed. And Bridge of Spies should not be missed. A very intriguing tale during the Cold War as we follow Hanks character James B Donovan as he negotiates to trade a Russian spy in return to bring an American pilot and student back home. The dialogue in this has to be great as it is indeed a talking film. Thankfully the dialogue is magnificent and makes you so intrigued in what is happening. 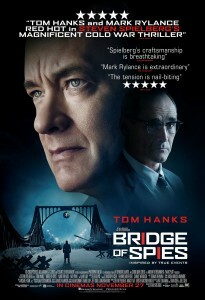 Bridge of Spies is an incredible film telling the story of an American hero unbelievably well. Tom Hanks brings a great performance which makes you care about Donovan as he faces all of the struggles to accomplish his mission. Ex Machina is a great sci-fi thriller featuring only four characters. Doomhnall Gleeson is invited by his employer Oscar Isaac to participate in a test in order to test his newly created Artificial Intelligence played by Alicia Vikander. Gleesons character starts to develop a liking to the A.I and he must decide where his loyalties lie- with his employer or with a machine. This was actually director Alex Garland's first outing which is incredible as he has made one of the best films of the year. A very interesting and intriguing film with great performances given by Isaac and also by Vikander. Oscar Isaac's charisma in Ex Mahina steals the show as he plays one of the more interesting characters of recent times. Filled with great dialogue which it needs as you would really not care about the characters if what they were saying wasn't interesting. A great film with a very interesting plot with many twists. First of all, JK Simmons was absolutely phenomenal in this movie. It is 100% clear to why he won the Oscar for Best Supporting Actor as this was an incredible performance. This film completely captivated me from start to finish in what was an excellent film. Credits also to Miles Tellar who was also great in this movie. If you have not seen this film you really have to. 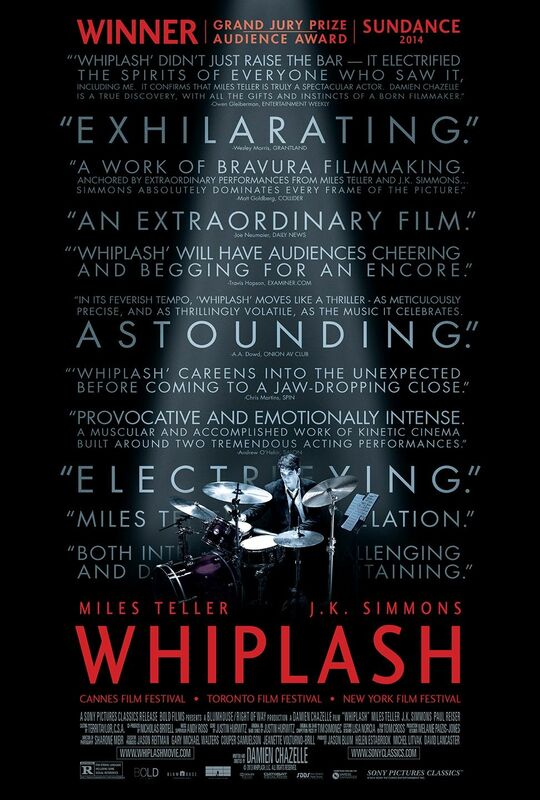 One of the most intriguing films that shows the struggle for Andrew Neiman (Tellar) as he aspires to be a top jazz drummer under the demanding and relentless Terrence Fletcher (Simmons). We see many highs and lows which show the demands from Fletcher as he and Neiman strive for the best and will do anything to try and achieve so. One of the best films of recent times and a must see for movie fans. Only recently I watched Birdman and it was one of the best decisions I have made. This is a true masterpiece created by Alejandro G. Inarritu showing the struggle of an actor best known for being the superhero "Birdman" as he tries to make it on Broadway. Michael Keaton, a former Batman, gives one of the best performances of his career as he stands out in a film full of terrific performances from the likes of Edward Norton, Zach Galifianakis and Emma Stone. This film is beautifully shot and makes me look forward to Inarritu's next highly tipped Oscar nominee film, The Revenant. It is clear to see why Birdman was up for nine Academy Awards and also why it won many including Best Picture and Best Director. Very intriguing film that looks at the life of this struggling actor as he seeks to make a name for himself and prove that he is not just a has been. A true masterpiece of film making which is definitely worth seeing. George Miller came back for another instalment to the 80's action franchise Mad Max. Now in most cases of recent continuations or of remakes of past franchises, they haven't gone too well- see Total Recall or any of the recent Terminators. Fury Road is nothing like that. Fury Road is a true spectacle. An incredible action movie that is better than any of the previous Mad Max's and will also go down in history as one of the best films of all time in the action genre. As a big fan of the action genre, this was the perfect movie for me. A non stop thrill ride from start to finish, Fury Road is one of the most wild films you will ever see. Loved by fans and critics alike, it was a very successful return from the Mad Max franchise. Tom Hardy takes up the role of Max with Charlize Theron starring alongside him as the incredible Furiosa. Miller brought us one of the best heroes of all time in Furiosa in this instalment to the franchise. Everything you'd want from an action movie with amazing sets, stunts and characters that pull you into the world of Mad Max. Fury Road was my favourite movie of the year and showed directors how action should be done. So many great moments and I cannot wait to see what is in store for us in the future. Definitely one of the best action movies of all time. This film is exactly why I go to the cinema. This is everything that a movie should be. This film is why I love movies. I haven't had a better experience this year at the cinema than with The Force Awakens. I haven't had so much buzz about a film ever. Everyone talked about it beforehand and everyone is talking about it now. I haven't ever experienced something that has consumed the whole world like Star Wars. And boy did it deliver. For a film that was built up so much and that I had been looking forward ever since it had been announced. Also as a huge fan of the franchise my excitement for this movie could not be contained. 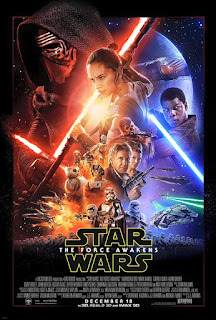 Quite frankly I haven't enjoyed a film in 2015 as much as I did The Force Awakens. This movie had me constantly smiling, laughing, hurting at it's twists and was constantly on the edge of my seat. Maybe my inner fan boy was taking over but I couldn't help but fall in love with this film. The returning characters such as Han Solo and Chewbacca along with the new exciting, interesting characters like Kylo Ren and Rey made this experience even better as my love for these characters grew as the film went on.. JJ Abrams did a great job of creating a great Star Wars story 30 years after The Return of the Jedi and we can be excited for Episode VIII. Quite easily my favourite movie of the year. Star Wars is well and truly back! So that was my list for my top 10 movies of 2015. 2015 was a great year for movies. We had the return and continuations of many great franchises. We've had many great performances this year with some actors really stepping up to the plate. A very enjoyable year at the cinema. Lets hope that 2016 can keep up and make another great year for us fans. I will be making another post showing the films that I am most looking forward to seeing in 2016 which I would appreciate you looking out for. Until then, thank you for reading.